He took me for a walk today. We went to Uncle Tree’s to play. so I could move, and swing, and sway. I love the boy, and he loves me! He hugs his teddy tenderly. a leprechaun out running free. a little man dressed all in green. to run across the road real fast. where rainbows dwell and life’s a breeze. 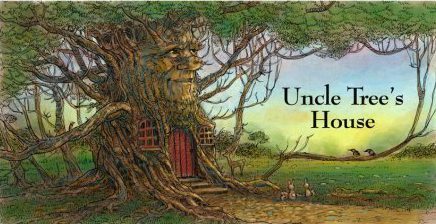 An enjoyable tale, Uncle Tree. Good to see you. Everyone talks to their teddy. Then I hope that includes my poverty. Nice bit of whimsy there Uncle. Maybe we too soon forget to hug the teddy and to early let go of the bear. for the way I treated him. Boys will be boys, yes. Aawww… this is a most beautiful, feel good poem. I really like your partnership with Aaron and his drawings. Beautiful, magical words and drawings. What a treat! Thank you. Aaron did go on to paint this one, and he posted it today on his site. It is enticingly pretty, you ought to check it out. This guy is good! 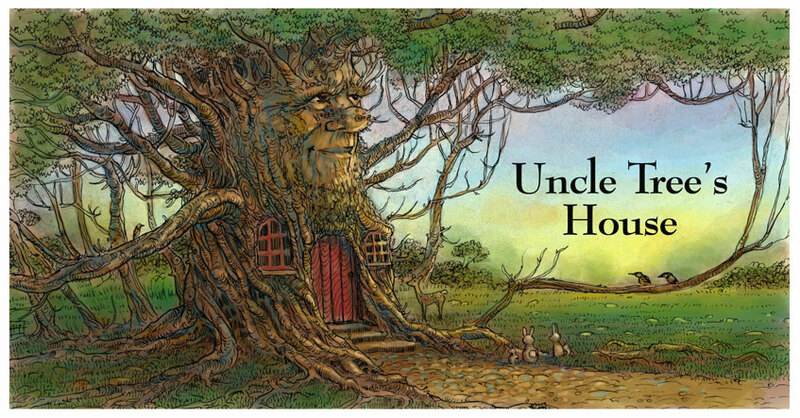 Welcome to Uncle Tree’s House! Come back and take a look-see! Aaron’s gifted me with a couple of prizes. Rainbow Eyes now has a face, and he’s got me nose, too! 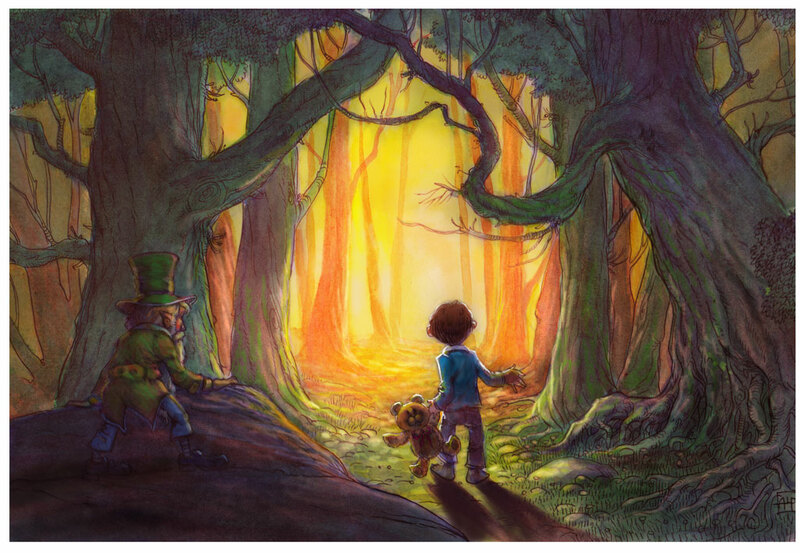 And, I’ve posted a reconfigured painted picture of Teddy Bear’s tale. It’s all good…so good…so good. Talk about luck, that’s me! I’m just really, really thrilled you stopped by. Good timing, little lady! Green beer? Uncle Tree ! This is beautiful ! I sense a great collaborative project coming on. What a beautiful book of children’s poetry, pictures and stories of pair of you could create ! Thank you, thank you, Colleen! (have you ever the similarity between these two words… Iran and Ireland? You’re a very kind-hearted human being, human being. a good excuse to drink in the middle of the week. I be a havin’ a Guinness me self. It be strong medicine. Hi dear uncle, I always remember and sometimes miss your kind words, but nowadays I am needing more peacful time to connect with your word properly. I am amazed at the ilustrations, how well they represent the text, besides they are lovelly, and trendy, you know that the black and white one is very similar to famous drawings done in the book alice in wonderland, which became a kind of hype nowadays. Glad to see you have done such a nice work, and that you keep exploring new paths to express yourself. and leave with a feeling of wonder and amazement. so I will set the record straight just for old time’s sake. cute idea. I then kindly asked Aaron if I could use (borrow) his work. who stuck his neck out by taking a chance on me, Uncle Tree. simple and elementary poem was called for in this case. I do thank you for your continuing encouragement. So you think it was trendy, too. Hmmm…that’s interesting. that be a negative. Do you copy? The meerkats are cool cats. I liked the 5-second otter pic myself. Yeah, yeah! Bauddha-boom’s back-at-cha! Do you know where you are? 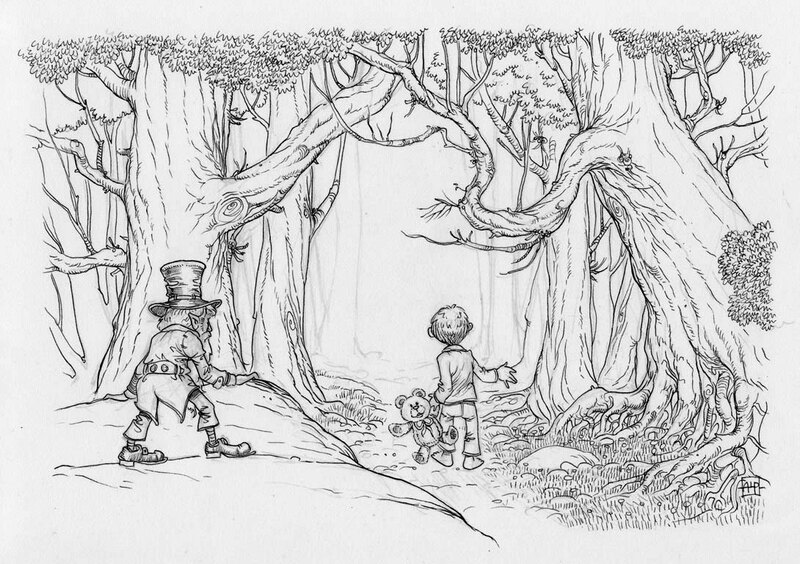 and wonderfully matched to aaron’s illustration (i’ve been to his website–AMAZING). I also think very highly of Aaron’s artwork. easily fit in at Disney World Productions — the way I see it. all hindered in one form or another. There are no exceptions to the rule. your expectations, they’re usually the culprit in this type of case. Thank you for offering that up, Mariana. but Alice’s face…well, mediocre at best. Aaron is bunches better in my book. Wait ’till you see the dryad, or wood nymph that he drew. I wrote a little ditty for that, too. Luvz and hugz backatcha, sweet niece! for another bit of serendipity. this is wonderful work. i keep saying wonderful full of wonder is what i mean. so glad to see it, and thank you! Your very own leprechaun painting and poem were awesome! The wonders never cease in a world that amazes thee. May they fill thy cup to the brim, time and again. Very whimsical and magical. Makes me want to step inside the picture. Thank you, Kim! Nice to meet you. Working with Aaron’s artwork has been a blast. Teddy finally gets to have his say 🙂 Lovely! I was lost inside the story.. seemed it was running in a motion, I stood there watching all that happen.. I like the feeling of a fairytale, beautiful and thoughtful. May you have many fairytales in 2011. Thank you very much for your visits and comments at Scent of my heart! 🙂 Thank you, Olivia! I’m glad you saw it as a super-short story. I truly hope the rest of 2011 brings you gobs and gobs of happiness! of peace, happiness, love and ‘All that Jazz’! Nice to read some light hearted fairytale type storytelling / poetry here. Hey there, Richard! 🙂 Glad you liked it! Aaron is an incredible artist, and he is still going strong. he will be somewhat famous in Australia by the end of this year. keep doing the lovely walking and talking..
What a sweet, sweet poem, UT. You could write a children’s book. And the illustration is superb. So glad you liked this little kiddy, Gayle! 🙂 I much enjoyed putting words to a few of Aaron’s works. Beautiful story Keith! glad to see you writing! love the illustrations too! I have a new facebook for 2zpoint it is still stuart steele and it looks like the other but I thought how cool would it be for my favorite authors to meet so don’t let it confuse you as it comes through I’m still working on it and on this site you are encouraged to post links and stuff you have written to get to know the others! Any way expect the request! Peace man! Hello there, Narnie! 🙂 Nice to meet you! to reach out to a complete stranger with your gift of benevolence. I will certainly look you up and pick your brain for learned info. That Mariana is something else! She has been quite supportive of me. Looks like I owe her a favor in return. Hmmm…I feel mischievous. So very glad you liked this, Stuart! It’s an oldie but goody, methinks. 🙂 We are now friends twice over. Simply beautiful,Uncle Tree! Thanks for stopping by at my blogsite and for the like! Very fine, Uncle Tree. Loved the poem and the art work, Thank you. Thank you kindly, Kristin! 🙂 Best wishes to you in 2012! Wonderful… I love the imagery here..
🙂 Thank you, Lady of the Heart! more like he had his stuffing falling out after…after…TB abuse. This poem was sorta my way of asking his forgiveness. above on his website, and I wrote this little ditty as a comment. He liked it, so I asked him if I could borrow it. He agreed. and I just up and asked him if he could put my face on one. He had it done in like two days. I loved it. It’s a great draw. 😉 Peace, luvz and hugz to you and Bumbles, Virginia! I enjoyed this poem and the accompanying picture. The painting reminds me of when I was little, I was probably about 5 or 6 at the time, and I remember in my class we had a teddy bears picnic one afternoon. It was great fun. Such is of The Kingdom. Have a great Sunday! What a great teddy bear tale! Really beautiful. So glad you liked it! 🙂 Thank you, Kimberly! You there, dear Uncle Tree. Hello sir! It’s been forever, I have finally landed on your branch again. It’s soothes me to read and go over the blog world, and of course, yours is one of the first I had to see. This is such beautiful and innocent peace. Five stars to that my old friend. and you have several days to live, laugh, love and fly free. My dear Rhee, thank you so much for coming this way once more! My poor bare branches loved your colorful interlude. You’ve always been kind and complimentary. Great illustrations with this poem. Have you published this in a book? Thank you, Allan! 🙂 Nope. No book yet. Uncle Tree remains free, as does his work. Beautiful. Full of delightful magic and lore… loved it! Great! 🙂 I’m delighted! Thank you, Christina! What a nice surprise! 🙂 Thank you so much! Hope you and yours have a Happy St. Patrick’s Day! How dandy! 🙂 Thank you, Frankie! in Australia. He’s the artist who created my caricature – for free. Great guy I just happened to meet via WordPress. LoL 🙂 I like Anne Murray’s version best. Thanks for contributing today! What a sweet compliment! 🙂 Thank you kindly, Em! Nice to meet you! ♥ Blessings from the Heart of America! Very sweet poem. I love it. Good, good! 🙂 Thanks for the comment, and your visit! This makes me long for feet pajamas, a teddy bear of my own, and a world that is forever filled with wonder and adventure. LoL 🙂 You read it perfectly! Thank you for visiting! I’m glad you liked. Thank you for bringing me to your site. I loved your poem and have pinned it to my Pinterest account so that I can access it when I teach poetry to my library classes. Yeah!!! 🙂 Thank you so much for allowing me to share! I’m pleased to know it passed the mustard. Awww 🙂 Thank you, dear Caro! My rainbow bows to you. Lovely poem, the world through the eyes of a teddy bear! Leprechauns are getting ready to celebrate Paddy’s Day I guess. to wing a tale within one’s imagination…or else! I love this illustration and poem too. you should write a children’s book! that I try not to ever use that darn word. Nice to know you believe so, tho. Thank you! I assume your Irish UT? Tomorrow is your day.Not too much or you’ll be going back to the Hospital! With reddish-hair, freckles, and ruddy arms, I presume I’m not all German. I have to frickin’ work 8 hours tomorrow, but I’ll have a 6-pack of Smithwick’s Irish Red Ale chillin’ and waitin’ in the fridge for ol’ UT. 🙂 Cheerz to optimistic leprechauns! good for you UT! Have a wobbly pop for me!